Dill is a member of the parsley family. Originally from the eastern Mediterranean region and western Asia, it was first mentioned in Egyptian medical texts about 3000 B.C. The name ”dill,” however, comes from an old Norse word dylla, which means to soothe. It’s thought to have gotten that name from the practice of making a weak dill tea to soothe a colicky baby. The Puritans used it to soothe older children. Parents would give dill and fennel seeds (known as "meeting seeds") to children to chew during the long church services to keep them quiet. The seeds are thought to suppress the appetite (and thus quiet a hungry child). They are also good for children being high in calcium. 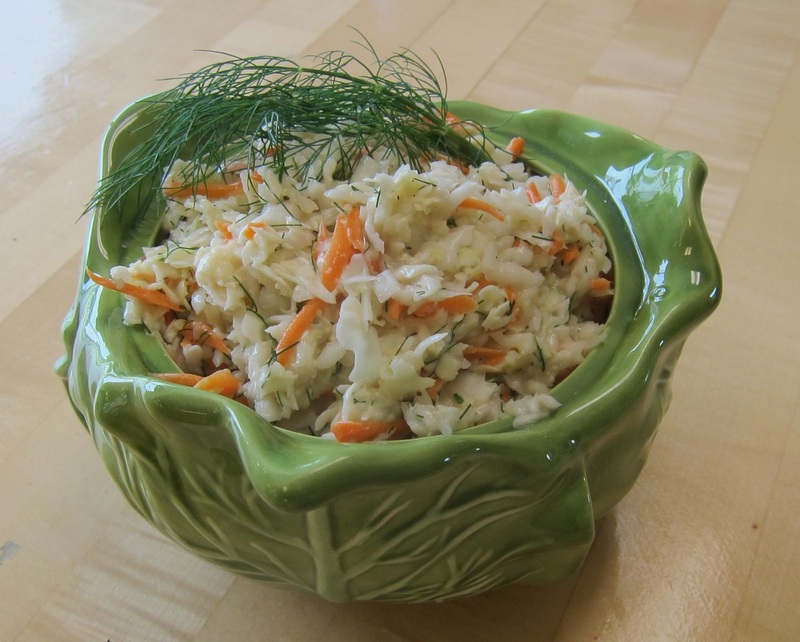 One tablespoon of dill seed has as much calcium as 1/3 cup of milk. Sprinkle the bright yellow dill flowers over a salad to add color and a hint of dill flavor. The flowers, leaves and seed of dill are all edible. It is good in dips and spreads, soups, potato salad, and egg dishes, breads and many vegetables but it is best known for pickles. Dill pickles are twice as popular as sweet pickles. Each year, Americans eat more than 2.5 million pounds of pickles. The leaves are what is referred to as “dill weed.” When a recipe calls for “dill” it is referring to the seed. Dill seed and dill weed are not interchangeable. The seed has a stronger, slightly bitter flavor; the weed has a more delicate flavor. Unlike dill weed which looses it’s flavor with heat, dill seed is intensified by cooking. The dill used for pickles are the early stages of the seed before it matures. Dill weed wilts quickly upon harvesting, but this will not affect flavor. Spritz whole stems lightly with a fine spray of water, wrap loosely in paper towels, place in a plastic bag and store in the vegetable bin of your refrigerator. It should last up to a week and perhaps longer. Or trim the stems, place in a glass with an inch of cold water, loosely wrap the top with a damp paper towel, and invert a plastic bag over the top before storing in the refrigerator. The flavor of dill weed is much stronger when fresh, but drying it makes it accessible year round. Like most dried herbs, 1 teaspoon dried is the equivalent of 1 tablespoon of fresh. Dill can also be frozen. The leaves will darken but it is still okay. When adding it to soups or stews, don’t thaw it out before using it. Dill weed loses it flavor in cooking so add it at the last minute. Spread cream cheese on crackers and sprinkle with chopped dill weed. Or add ¼ cup minced fresh dill weed to ½ cup softened butter. Refrigerate at least 2 hours before using to let flavors blend. Use on homemade breads or broiled seafood. Or mix chopped dill weed with plain yogurt and mix with fresh cucumber slices. Or add dill seeds to carrots and while cooking or stir add them with butter after cooking. Blend together. Spread on bread. Top with cucumber slices or lettuce if desired. room temperature. Dissolve yeast in water. Add the cottage cheese, egg and oil. at 350° for 50 minutes. I tend to like my muffins on the sweet side; these are not. However, slather the butter on a hot muffin and you won't miss the sugar. Mix dry ingredients separately. Mix together water, butter and eggs and stir into dry ingredients just enough to moisten. Bake 25-30 mines at 350°. These are actually surprisingly good...a great spring cookie. Even Joel liked them and he always said there are only two kinds of cookies -- chocolate chip and everything else. My sister wouldn't try them because she knew what was in them but I won't complain because she always gave me her dill pickles from her hamburgers when we were growing up. She really doesn't like dill. If nothing else, they have been a great conversation piece. Process the lemon verbena leaves with the sugar for a few minutes until the lemon verbena has been pulverized. Cream the butter and ½ cup sugar. Add zest and vanilla. Beat two more minutes. Add flour mixture. Beat on low just until soft dough forms. Stir in dill and pecans. Chill dough for 30 minutes. Roll into balls the size of large walnuts, roll in remaining sugar and press down with a glass. Bake at 10-12 minutes at 350°. *If you do not have lemon verbena you can substitute 1/4 tsp lemon extract. We used to have these for a quick meal when I was young, often with a sweet Swedish rice (rice cooked with sugar, milk and cinnamon). When I asked my mom for the recipe, it was rather non-specific: crumble some crackers and mix it with the salmon and an egg until it's the right consistency, form patties and and then fry them. This recipe is just like Mom used to make, only a little more specific and a few more ingredients...but just as good. Drain the liquid from the canned salmon into a large mixing bowl. Set the salmon aside. To the salmon liquid, add mayonnaise, onion, celery, egg, and dill weed. Mix to combine. Remove any skin from the salmon (and the bones, if they bother you). Fold salmon and bread crumbs into the mayonnaise mixture. Cover with plastic wrap and refrigerate for 30 minutes. Preheat skillet over medium heat. Add olive oil to coat the bottom. Form salmon mixture into 4 to 6 patties and fry in a hot oil until there is a nice dark crust on each side. (Do not try increase the heat to high or the patties will brown on the outside but be undercooked in the center. Mix all ingredients together and refrigerate for at least one hour before serving.